A defender from Bundoora in Collingwood’s northern suburb heartland, Croall joined the club in its under-15 development squad and moved through the under-17 and under-19 teams. He captained the under-19s to a premiership under Keith Burns against North Melbourne in 1986, playing in a team that included the likes of Gavin Brown, Gavin Crosisca, Mick McGuane and Damian Monkhorst. Croall played on future North Melbourne champion Mick Martyn (who was then playing as a full forward) in the under-19 premiership and ensured he did not kick his 100th goal for the season. He made his senior debut the following season, and played a career-high 17 senior games in the No. 56 jumper. Although he managed 11 games in 1988, opportunities dried up in the years that followed. Croall played a total of nine senior games across his final four seasons, often late in the year. 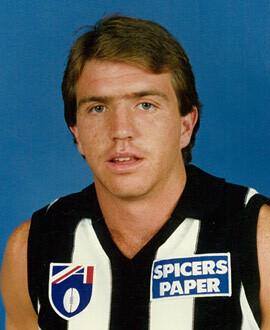 He played two games in 1990 and made his final appearance against North Melbourne in round 22, 1992. Croall captained the reserves team in 1992 and won the Joseph Wren Memorial Trophy as the side’s best and fairest player. Once he left Victoria Park, Croall tried out at Melbourne ahead of the Pre-Season Draft but hurt his knee during a practice match, thwarting his chances of a second chance. Croall moved to Sandringham and later Northcote Park, where he won a premiership in 1999.